Because the Lehites "exceedingly rejoiced when [they] came to the seashore" at Bountiful (1 Nephi 17:6), Bountiful must have been a fertile area—especially for arid southern Arabia, where they are thought to have journeyed from Jerusalem. 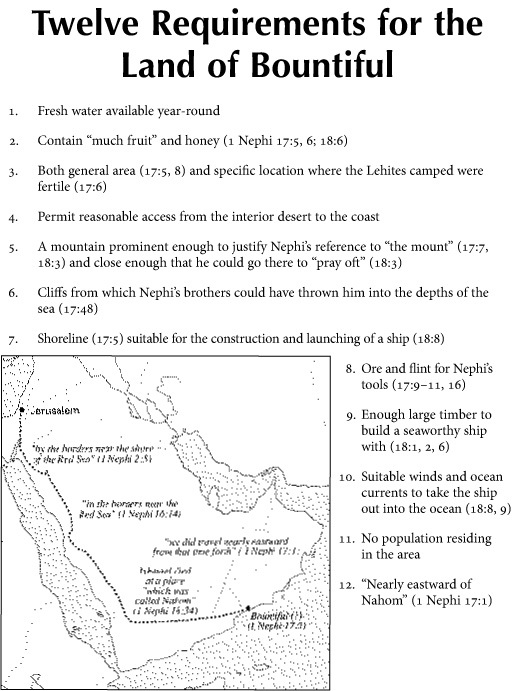 Twelve required characteristics of Bountiful, identified by Warren and Michaela Aston, narrow the location of Bountiful to six spots along the Arabian coast. The current-day Wadi Sayq (more specifically Khor Kharfot, a portion of Wadi Sayq, located in Oman) is the most probable location of Bountiful because it is the most fertile coastal location on the Arabian Peninsula. Unless the wadi is reached by traveling through the Arabian interior, as Lehi would have done, Wadi Sayq remains almost completely hidden. Wadi Sayq lies "nearly eastward" of Nehem, Yemen (assumed to be "Nahom"; 1 Nephi 16:34; 17:1), and is the only area in which fruit grows without being cultivated. It also contains the largest freshwater source on the Arabian coast. The twelve required characteristics for the land of Bountiful are listed in this chart.